Are you ready for the holiday season? Sadly, I am not. Not even close. My mind is somewhere in early October. But it is officially upon us and I’ve got to face it. 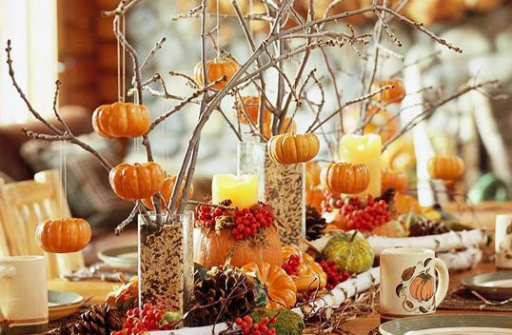 Have you planned your decor or table settings for the Thanksgiving holiday? I am thinking about it today. Below are several images that I find inspiring for the 2012 Thanksgiving celebration at Casa Wood. I hope you’ll find inspiration for you decor, too. Enjoy! I love the contrast of blue and orange together. It’s a nice twist in the decorating color scheme. The rustic place mats are a nice textural element. Simple, yet clever use of candles in a centerpiece. A modern take on Thanksgiving table settings. It’s simple, with a great color palette in the graphic table cloth. A wonderful natural centerpiece – pine cones, twigs, berries, gourds, rice. It feels very mountain cabin -like to me. A colorful take on Thanksgiving. This feels like Cinco de Mayo meets Thanksgiving and I love the energy. A wonderfully simple design. The burlap place mat and brown paper and a great contrast to the white plate. And the message is perfect.